Oh, what a great show! First of all I will say that Wendy's green suit was very wearable and I would actually buy that, but I thought her collection looked more like regular department store ready-to-wear. Kara's things were lovely but I was really thinking that it was not that exciting. If I could buy Jay's purple coat right now I would do it! It was stunning! 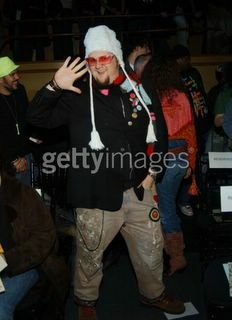 I loved his monochromatic looks, and his skill in sewing really was shining in those patchwork pieces. I am thrilled that he won! His collection was original,showcased his technical skill and was wearable(I know many would disagree with this). The patchwork coat and that amazing blue patched leather skirt were fantastic. Kara is amazing at tailoring. Her clothes fit so perfectly. However she lost me with her slick move with the shoes,getting snarkey with the Parsons man and not admitting that she was not inspired by Gucci. The metal hardware on that dress was so Gucci. It was just silly to think that an editor at Elle and Michael Kors would not see that. Did you notice how quickly karma got her on those shoes? Most of the models had a horrible time trying to walk in them. I really look forward to the next season! Patti you need to try out! Annie! I missed the shoe drama and am going to watch the rerun of the show today at 5pm on Bravo. At that particular time, my doggie needed to go outside! I loved everything about Jays collection. It was strong and innovative. I loved when he was instructing the models and said "think german". That cracked me up. His collection fit perfectly with what the other high end designers were doing that week. I think he has the potential to do amazing things. I do not think he will be the next Christian Roth. Remember him? The critics adored him. I was lucky to see on eof his pieces at FIT. The curator stated that it was the most perfectly executed piece she had ever seen. That has always stayed with me. I wonder where he went. I think Wendy would design well at Anne Taylor. She slightly redeemed herself to me when she recognized Jay's genius. She was very overwhelmed and was way out of her league. How could she have forgotten about accessories? I had pity for her near the end. I was a huge fan of Kara during most of the challenges. She let me down with her collection. I was annoyed when she said that she was not inspired by the time period of Howard Hughes but of his ambition. I did not get that answer. It screamed hollywood glamour to me. Did you notice how huge the shoes were on the models? The one girl seem to be struggling with keeping them on as she walked. It was painful to watch. I can not wait till the next season. I love Tim from Parsons. He is such a gentlemen. I think I love him as much as I love Jay. I am so glad I got to watch the show again. Randolph Duke and George Simonton are smart to take a lesser collection to the shopping channels. I read an article in Allure this month about the cosmetic companies who sell on QVC. Specifically, Philosophy, who stated that Barneys no longer sells that line because they would not carry a line that was sold on the shopping channels. But the philosophy rep stated that they sell more product in one visit than they can sell in months in the stores. You can't argue with that kind of selling. A rep from Prescriptives said that they sold more of that magic creme compact in one airing than many of their stores sell in a year! Now that I saw the shoe drama with Kara, I am stunned that she would try to pull off a stunt like that. When she was on the phone with her shoe connection telling them to write her an invoice for $10 a pair, I knew at that moment they would never let her win. Wendy's designs are very sellable, other than the see-through top! LOL! Hi Patti! I agree with what you said about going the home shopping channel route. It's staggering how quickly they sell out of items--from Jessica Simpson to Joan Rivers. Anyone that has the opportunity to market their wares there is fortunate. I'm sure that was the only viable option for mainstream success in fashion design. I just think it's sad when people who are singled out as top-tier at one of the most prestigeous design schools in the world are no longer designing haute couture and are just licensing out their name for some cheap, crap made in China. *think Halston and the JC Penney's fiasco* I ordered two of the Randolph Duke's sweaters because I thought the design was very flattering, but even dry cleaning once has caused them to pill. There was nothing in the "Simonton Says" collection that was even worth ordering. When I met him, his big claim to fame was the "car wash" skirt. I was never fond of those, and he's still got them in his line 10 year later. As an aside, I forget who he said bankrolled his start, but I beleive it was the founder of Weight Watchers's wife. Also, Ann, I created a new user name, and I think I may go in and delete all the posts made under that previous name because I don't want it out there anymore. The existence of this show nearly convinced me to pay for cable, but I passed. I'm sorry -- it seemed like excellent television. I know nearly nothing of the personalities or drama involved, but I did see photos of the NYC shows, and Jay's stuff was all, uniformly, something I would be desperate to wear. It all fit my idea of my ideal style to a T(bone) -- urban, whimsical, young but sophisticated, modern, colorful, daring. I thought Kara's collection was beautifully sophisticated, sensual and elegant, and totally different from Jay's. In terms of vision, Jay had it all. Kara's was lovely but it didn't give you the electric thrill of seeing something that makes you think about the whole experience of wearing clothes in a different way. Jay's show was an inspiration. It made me want to go into my closet and put it all together in a different way. I loved it. And him! He looks like a great big bear! You want to just give him a hug. Want to buy any of it? Love this Marc jacobs outfit!